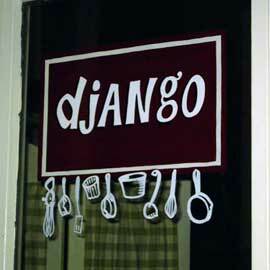 Djangos accoutrements are visible through its entranceways glass-faced door and adjoining store front window. Sunset colored walls provide a playground for a multitude of farraginous posters, including, inter alia "Charlie Chaplin," "Tabarin" and "The Wizard of Oz." Look closely; theres the color of emerald green somewhere in every one of them. Tables in this small hallway-shaped restaurant are covered in white cloths, over which have been draped another layer of linen with blue flower prints. Waitpersons (almost all of the female gender) wear aprons over street clothes. The aprons prints emulate that of the top tablecloth. Miniscule glass lamps are illuminated with the smallest of candles. A brioche baked in a flower pot arrives. Its bulb-shaped bread, redolent of crusty wheat, reminds one of the contraption used by Dorothy in her attempt to return from Munchkinland to Kansas. Beside the bread is an upside-down porcelain butter urn whose purpose could be to wet a morsel of brioche, or shine ruby slippers. Married owners Bryan Sikora and Aimee Olexy provide "monthly" menus, using the most luscious local produce as staples for the freshest fare. Bryan has plenary power for plating the First Courses and Entrée Courses, while Aimee is benignly dictatorial in designing, describing and hand-delivering desserts. Both Novembers and Decembers menu include Saffron and Sherry Infused Mussel Bisque, Salt Cod Fritters, and Herb Olive Oil ($7). An unimpeded wintry wind would have to be wafting between your ears not to order this soup. Cruelly creamy olive-colored liquid languishes in a low bowl until your silver soup spoon dabbles its tranquility. A heated mouthful is transported to your lips, with your eyes measuring the spoons capacity. Those same eyes shut dreamily as your tongue is bathed by diluvial flavors hinting at mussel broth and a shameless soupçon of sherry. A cod fritter is delicately chewed, escaping down your throat after a burst of a scintilla of saltiness. Ones medulla remains coated with a satin aftertaste. For fear of writers gout, I will not mention this First Course: "Game Tart," Braised Boar, Venison, Pearl Onions, Pastry, Fried Quail Egg and Foie Gras Sauce ($12) except to say (1) its aromas will leave you breathless; (2) its chunks of "beef" will take "game-playing" to new meaning; and (3) its warm concentrated egg yolk in lively livery foie gras gravy, will make your knees tremble and your ankles yearningly ache. I would refrain from the Curried Scallop and Pistachio Terrine, Pesto of Fines Herbes, Rice Chips and Pistachio Sauce ($9). This is not an ample First Course, and evokes "interesting" in a jello-jiggly risible way. It may be that scallops are better left hurriedly uncurried, and never matched with pistachio paste and pesto of high-fallutin "fines herbes." This item, which appeared first in December, should be lost for January as a New Years resolution. But, as the old adage goes: "He who never made a mistake, never made a discovery." "Inventive combinations" is the expression most used to differentiate Bryan Sikoras cooking from chefs with voids of imagination. Bryan succeeds almost always. His Entrée Course offerings are astonishingly comestible. For instance, if youre a placid "prime rib" type of diner, try instead Roasted Bison Loin, Braised Cabbage and Sausage Choucroute, Potato and Horseradish Cream Sauce ($23). The latter makes the former seem like bland canned food. Bison loin is rich, red and lean. It tastes like the combination of a well-aged juicy porterhouse filet and a perfectly cooked ostrich breast. The cabbage and sausage bring spikes of melded garlic and pepper to the palate. The potato-horseradish combo brings comfort and tang. A lone baby carrot adds sweet humor. The probability of tasting all these ingredients at once is only worth betting on at Django. Bring your own best Burgundy as a complement. Moreover, whenever the Entrées include "goat cheese gnocchi," "tangled lobster," "spy apples," "almond milk" or "crispy tentacles," you can bet the house. And finally, the best dessert for last. It will be difficult to avoid the Hazelnut Madeleine Cakes, Coffee Ice Cream and Creamy Butterscotch Sauce ($6), or a Candied Orange Crème Brulée and Crispy Phyllo Napoleon in Vanilla Sauce ($7). 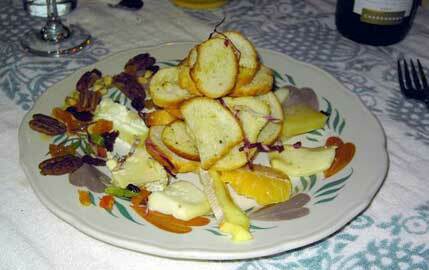 Notwithstanding, don't hesitate to obtain the Artisan Cheese Tasting Plate, Honey, Nuts, Dried Fruits and Toasted Croutons ($11). Aimee presents her cheese selections as if they were characters in a play, with identifiable personalities. "This has a buttery complexion from a late summer wheel," she summarily intones, pointing to the top of a round plate with an ennead of chosen cheeses, "while this one is brusque from Corsican sheep where the grass is really green." Her joyous monologue mentions "the Netherlands," "Normandy," "English Stilton" and "aged in the Pyrenees." "Start at one oclock for the mildest, and simply head clockwise toward the sharpest," she counsels. I can only advise that time cures all. If you were to put BEST & BYOB & PHILADELPHIA as your Westlaw query, thered be one result: "Django."